The production of methane as a natural gas substitute (SNG) is one of the possible contributions to the energy mix of the future. In addition, bioenergy is easier to transport and store via the route of SNG production and through the use of the already existing natural gas infrastructure. Under the current conditions, production of SNG is only economically viable on a large scale from coal and all secondary products. In order to be able to produce SNG even in a smaller power range suitable for biomass applications, the plant complexity must be minimised. Within the framework of the EU project “CO2freeSNG”, simplified plant concepts were developed through process optimisation and increased system integration. A particularly high optimisation potential is provided by the hot gas purification of synthesis gas. In the course of the research project, the entire process chain of SNG production, from allothermal gasification, through hot gas cleaning to methane synthesis, was investigated. 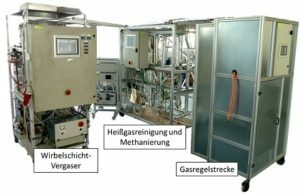 The focus of the work presented here is on hot gas purification and methanation, which is an integral part of the hot gas purification process. Main impurities in the product gas of biomass gasification are not only particles, but also alkali and sulfur compounds, especially higher hydrocarbons and tars. Particles and alkalis are deposited in sintered metal filters. Sulfur compounds are removed from the gas via high-temperature fixed-bed adsorbers with different adsorbents. Particularly promising is the fact that tars are not purified but are directly converted in the course of methane synthesis and are thus available as an additional starting material for methane production. In addition to excluding the tar cleaning, this also leads to an increase in the efficiency of the process.